You don’t get a name like “Greek Mountain Man” by chance…it’s completely earned. Let me elaborate by giving you a glimpse of a typical day in my hiking shoes. Let’s begin with a recap of my day today. It was another snow blanked day amidst the Teton Mountains in Yellowstone Country. The wind was kicking up as I felt the frigid mountain air crisply against my face. Fortunately the sun was out intermittently today as it made the snow glisten like glitter. I was cold, damn cold and not to mention hungry, though the determination of my mission at hand kept me focused. It was day three, my fingers felt frozen and yet I still found myself on the prowl looking for the famous Sasquatch within the brush by the creek where I had my first encounter. While on my search for Sasquatch I found this little itty bitty Sasquatch on the side of the road. Just kidding… this is a porcupine. This made my day!!! It might as well have been a Sasquatch because I hunted him down for several days. For 3 days straight this creature eluded me. He did everything in his power to make sure that I would not get a shot of him looking my way. This little guy is quite the master of disguise. I literally spent the last three days there trying to capture this picture. Each day I would spend on average anywhere from four to seven hours at a time hoping to capture the perfect shot. As you can see the sagebrush and the trees are everywhere. This porcupine really gave me quite the challenge. It was so difficult as most of the time he either had his back to me, was rolled up in a ball, was climbing a tree, scratching his backside or he was doing everything possible to make sure that no one could see him. Or, maybe he was just oblivious and didn’t care. I tell you what, these little Sasquatch beings are very elusive. This was my first time ever even witnessing a porcupine. Point be made, I didn’t even know porcupine could climb trees; until today that is. It was even interesting how I first noticed this guy. He was actually sitting on the side of the tree as I was driving by. When I fist spotted him I thought it was a moose head. At a second glance that’s when I noticed what I really had found. As I got out of the car for a closer look, I noticed this little creature moving around and realized it was a porcupine. 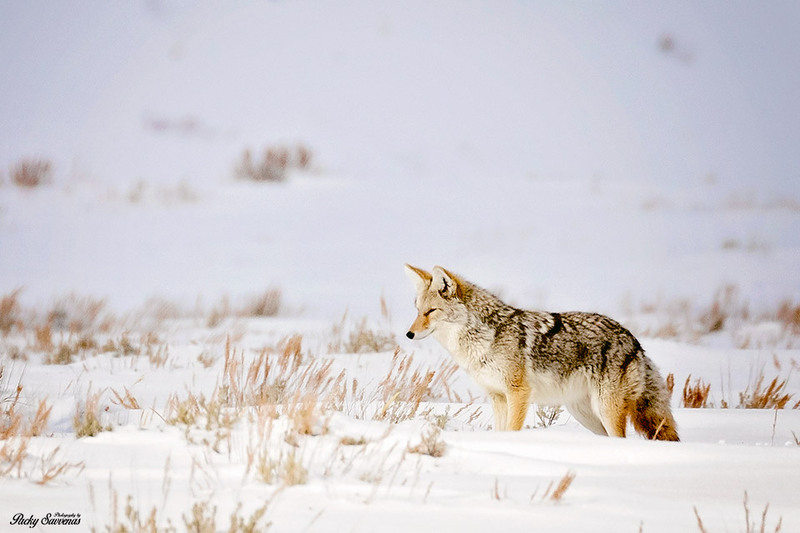 He was hiding within the sagebrush and all the surrounding branches. Quite honestly he was like finding the needle in the haystack. So many people pulled over to witness and try to capture a photo of this little guy. 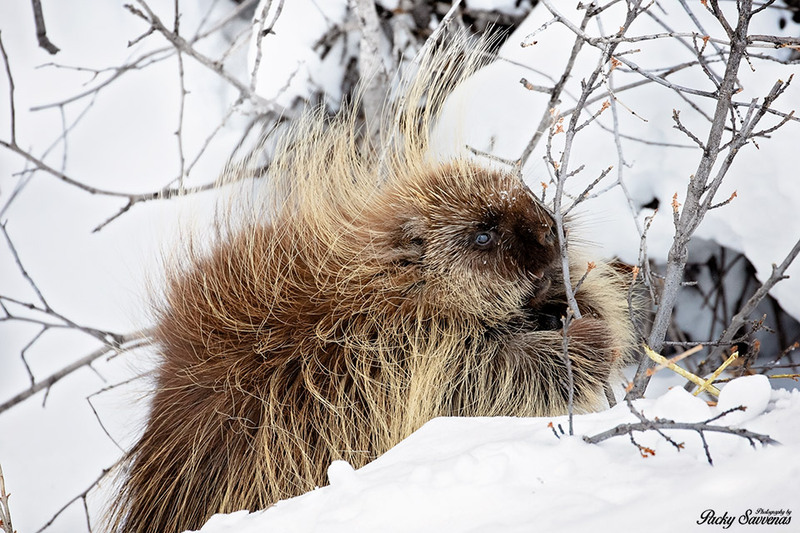 They would try to get a snapshot of the porcupine and after about 20 to 30 minutes they would give up due to the brush or from trying to brave the harsh winter conditions. There were times where it was absolutely freezing with no sun, the wind would be blowing and the snow would be drifting. The weather in the Grand Tetons is very unexpectedly crazy and it can change at any given moment. I can not explain to you enough just how hard it is to spot a porcupine, let allow try to photograph them. Porcupines make it quite clear that they do not want you to find them. They do everything they can to try to hide everywhere they go. So, how did I manage to get such a photograph? With a lot of determination, braving the harsh elements and a name like Greek Mountain Man, I’ll do anything for the shot. Stay tuned and subscribe for my next unexpected adventure.